When we hear about Kangen Water, what usually comes to mind is that of healthy drinking water that has many benefits for the human body. This is often associated with the word “alkaline water ” or “ionized water”, others even call it the “miracle water “. What makes this a safe and healthy drink is what we will find out about Kangen water in this article so read on, as we will uncover everything about Kangen Water. The word “Kangen” is a Japanese word which means literally “return to origin” or back to its original state. The Kangen water history started its roots in Japan after World War II (the early 1940’s) started to search for a clean and safe drinkable water. This has led to the popularization of processed /treated waters , importation of bottled (mineral) waters and the coming and introduction of new technologies for water purifiers in the region. The Sony specialty trading operation, the precursor of Enagic started its operations in June of 1974 in Okinawa ,Japan and started by Hironari Oshiro. It was in April 1987 that the Japanese Ministry of Health and Welfare authorizes the Enagic Osaka factory as a medical equipment manufacturer. March 1988 marked the year of Enagic company as the Kangen water specialist and introduces the Philosophy of True health. The year 1990 was the year when the company changed its name to Enagic and began selling Kangen Water. To avoid confusion the name ENAGIC is the name of the company and the sole manufacturer of the Enagic Kangen water machines. The term “Kangen water “ is the water produced by the Enagic Kangen water machines through the process of electrolysis. Electrolysis is the technical term or the scientific term for splitting substances through the use of an electric current. The Electrolysis of water is the splitting of its chemical composition of hydrogen and Oxygen thru the passage of electric current. 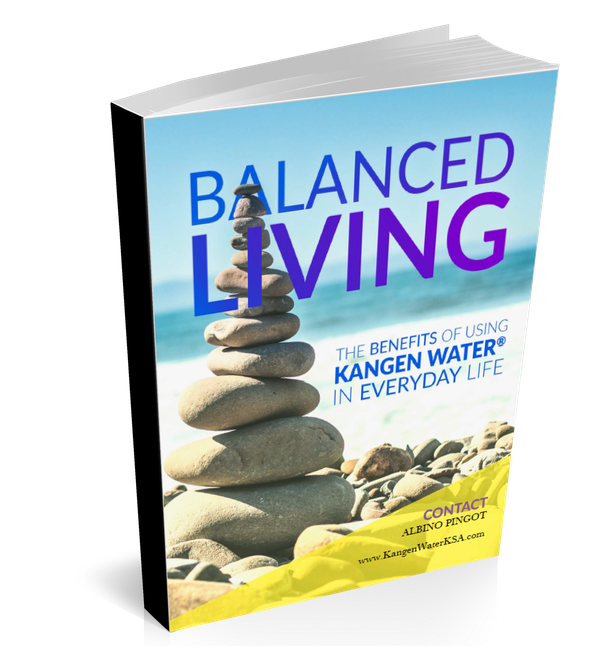 How does Kangen Water become Alkaline Water? The word alkaline water is often measured by its pH value, the pH is the measure of the acidity or alkalinity of a certain substance. The normal pH value of safe drinking water is at the ph value of 7 which is the neutral or reference value if water is acidic or alkaline. For the case of water, alkaline water is with a pH value of 7 to 14 , below the pH value of 7 is considered acidic. Kangen water machines produce both alkaline water and acidic water and both has its own unique advantages and disadvantages depending on its usage and purpose. Thermal conduction – It doesn’t take a long time to boil. With coffee and tea, the taste and aroma are everything and putting out more color and flavor achieving a richer fuller taste. With other strongly acidic foods such as meat and eggs, the alkaline Kangen water helps your body balance the acidic effects. In washing fruits and vegetables, the Kangen healthy water removes the raw taste of onions and other strongly flavored vegetables. In cooking rice, the Kangen water used ti wash and cook rice bring out delicious and fluffy rice. Noodles and pasta willtake a brilliant shine and improved textures as a result of boiling in acidic water.Acidic water will enchance the batter and crispy texture oof fried foods. The three-layered high power formula filter removes not only chlorine but also sediments such as rust and impurities. Clean water tastes delicious and filled with essential minerals. Clean water is best used to take medications and in making baby formula. Strong acidic water is a type of electrolyzed water containing hypochlorous acid produced by the anodes. It is the result of adding the electrolysis enhancer to the electrolyzes reaction. Generally, the pH level is 2.7 pH and the ORP is over 1,100mV and is not a strong acidic chemical substance. Excellent cleaning and disinfecting power with this strong acidic water has the excellent disinfecting power that helps prevent food poisoning and can be used to clean and sterilize your produce, meat, and cookware. Kangen Water is popularly known as the miracle water, Oftenly called the ionized water and commonly called the alkaline water is the water produced by Enagic Kangen water machines. The term Kangen was derived from the Japanese word meaning “returning to origin”.This made the Kangen water more popular because of its alkaline effect which returning the body to its alkaline state (original)state of the body). The company name Enagic was founded by Hironari Oshiro in June 1974 and Branded its name to Enagic in 1990. The Kangen water machines produce 5 types of water thru the process of electrolysis which includes the popularly known as alkaline water (with a pH value of 8.5 to 9.5) is the safe drinking water with many health benefits. Other Kangen water with Lower pH (6.0, 2.5 ph and Below) considered to be acidic waters have also some usages from toning the skin and cleaning the body to other sanitary and disinfecting effects to home appliances and fixtures. Feel Free to comment below for more inquiries about Kangen Water.